Impress your guests with a quilted table runner for the holidays! Looking for a fun DIY decorating idea for the Christmas season? Download this free quilting pattern for a table runner. 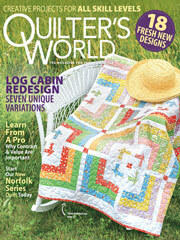 The design uses the ever-popular Log Cabin quilting block. Size: 14 1/4" x 42 3/4".